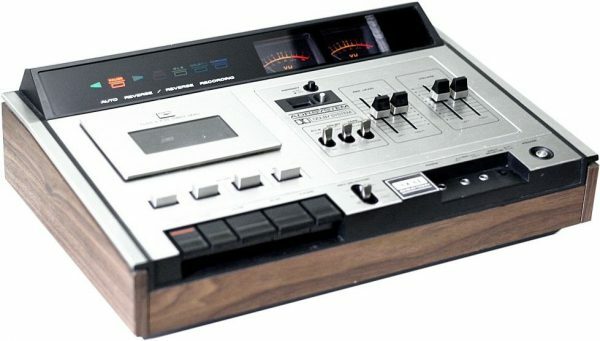 The cassette deck in which an auto-reverse Recording play is possible. Two flywheels and two capstans are attached to a machine, and the auto-reverse Recording play of the both-way same characteristic is made possible with the tape drive system which makes a drive belt always drive in the fixed direction. Operation can be performed only by setting a reverse mode selector to the mode of a wish. GX head is adopted as a head. Unlike a permalloy or general ferrite, it is made of a single crystal which is proud of the outstanding magnetic property. Since the whole core is a single crystal object, antiwear quality is excellent, and it is wrapped in super-hard glass with the still more nearly same wear characteristic. By this, the form of the whole head can be built ideally. Moreover, the recording/play which made the sharp magnetic field on a focus with the small amount of compensation of an equalizer, and was excellent in the dynamic range, or S/N and a distortion are possible. The reverse mode selector is carried. When carrying out the recording/play of only one-way one way, carrying out the auto-reverse recording / play of 1 round trip to Non and performing Single and a continuation play, it carries out to Cont by setting a selector. While this selector had been set to Cont, when it changes into a recording state, it is automatically switched to Single. A. The D.R (Automatic Distortion Reduction) system is carried,Since a recording equalizer is changed automatically and it records in accordance with the dynamic range of a tape with the level of an incoming signal,The recording in a portion with the sufficient linearity of a high region is attained, reduction of the record signal by a previous distortion and demagnetization action etc. is lost, and frequency-response degradation with high level, distortion, and a beat are stopped. The Dolby system is carried. When recording on a tape, and the case of only compass lower than a fixed level with an incoming signal and the whole volume are small and noise is conspicuous, a Dolby system raises volume automatically and makes the whole volume difference compress theoretically. And only the quantity automatically reinforced at the time of a play is decreased, by the system of returning to original balance, at the time of a play, it is taken out as well as an original sound by this, and noise is also reduced. If the Dolbey change-over switch is turned ON, a high-definition play sound can be enjoyed. O. The L.S (Over-Level Suppressor) circuit is carried, by switching a switch, when a level is exceeded, even when a momentarily excessive input enters, sound is not distorted but a distortion is pressed down. The tape change-over switch is carried, and in using a chromium tape, when [ which will turn other low noise tapes on the Chrome side ] carrying out, it moves a switch to the Low Noise position. This changes the amount of frequency compensation and the engine performance of a tape can be pulled out. The function of the color indicator lamp which directs each operation correctly, a triple figure index counter with a memory button useful for search of a program, large-sized UV meter, a pause button, an automatic stop, etc. is carried. The hysteresis synchronous motor is adopted as a motor. Moreover, the amplifier part has adopted low noise and low distortion silicon transistor amplifier.